If you had to rate your stress on a level of 1-10 (10 being the highest), what would it be? There are emotional, physical, mental, and spiritual symptoms of stress. I’m pretty sure that everyone has experienced high levels of stress in their lifetime at least once! Whether it is a positive or a negative stress is another thing…there are several different types of stress. Each type depends on the length of stress, the stressor, the effects of the stress, etc. Eustress, acute stress, episodic stress, and chronic stress all have different stressors and different consequences. Stress can be good, meaning that you care enough about something, but anxiety on the other hand can be bad. This means that you can no longer handle your stress effectively. You might not even know that you are stressed until you learn what some of the symptoms and effects of stress are. The body is an amazing thing; how it responds to different stressors and hormonal changes. Do you ever feel like you are exhausted or overwhelmed? Are your muscles ever tense, do you get migraines, or do you have trouble sleeping? If so, you could be over stressed! After being in a stressful state, your body will try to cope with stress and your body will enter a different phase known as the exhaustion phase. The exhaustion phase is the most damaging on a cellular level and will eventually lead to a burnout. For example, when I’m stuck in traffic, I find my shoulders raised to my ears and my jaw is clenched tight. My hands are death-gripping the steering wheel and I’m sitting on the edge of my seat! This tenseness is due to an initial secretion of the hormone adrenaline, which triggers the hormone cortisol to be released to sustain the energy necessary to cope with stress. Being stressed requires a lot of energy because your body goes into a defensive mode. Your body is prepared to handle any situation in a “fight or flight” response produced by the sympathetic nervous system. Who knew being stressed could be so much work?! Once this response occurs, your body uses energy to try to bring it back to homeostasis. One of the questions that we ask our clients during our weekly appointments is about their stress level. Weight loss and weight maintenance can become difficult when stress levels are high, which is due to the hormonal response to stress. 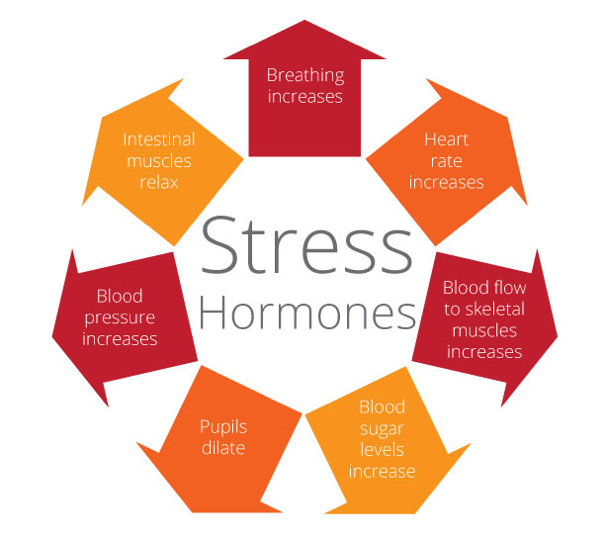 The hormone that is most commonly related to stress is cortisol (mentioned earlier). Cortisol is a fat storing hormone, specifically the abdominal area. 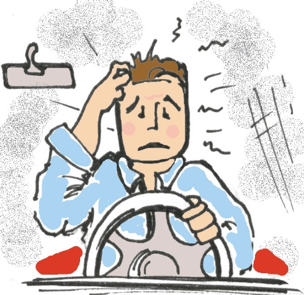 If someone is working really hard to lose or maintain weight, but he/she is constantly stressed, their cortisol levels will be high, which in return means that their body will be trying to store fat! This is the opposite of what he or she is attempting to do in the first place! So now that that we know why and how our bodies react when we may be tense or stressed, how do we deal with it? There are many different types of stress management strategies such as yoga, meditation, exercise, etc. If you haven’t heard of our Awaken Mastery Tapes (AMT), I would recommend learning about how awesome they are. These soothing audio tapes help you relax and take you through guided imagery, meditation, and creative visualization to help relieve stress. You can learn more at our website (https://www.awaken180weightloss.com/program). We have an entire series devoted to stress reduction! Some other ways to manage stress on the run: ratio breathing, progress muscle relaxation (PMR), mindful body scans, and guided imagery. For times when you are stuck in a situation when you do not have a lot of time to work on stress management, give some of these examples a try. Ratio breathing can be done anywhere; in traffic, at your desk at work, at the dentist, with your kids, etc. Engaging your diaphragm by breathing to a ratio of 1:2 by inhaling to the count of 2 and exhaling to the count of 4 can help lower your heart rate, lower your blood pressure, and loosen tense muscles. Who would think that just breathing deeply through the diaphragm could help you decrease your stress level?! Well…give it a shot! Be sure to place your hands over your chest and belly to feel the belly rise and sink with each breath. 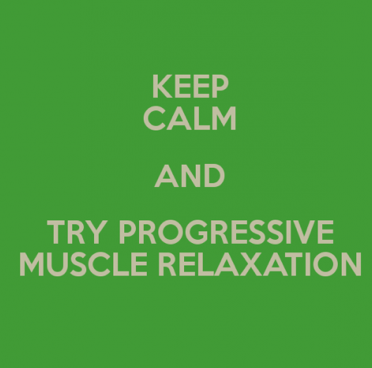 One of my favorite stress reliefs is progressive muscle relaxation (PMR). This technique is used to feel the contrast between tense and relaxed muscles. By working your way through each body part, tense the specific muscle for 10 seconds and then relax for a count of 20 seconds. Your eyes should be shut as well to get the overall effect. If you didn’t realize if you were tense to begin with, try tensing your muscle and then relaxing; do you feel the difference between the two now? PMR is physically and mentally engaging your body to help you focus on relaxation. This is a great tool to use if you are having trouble falling asleep as well. Stress can be unavoidable at times and it’s not always a bad thing…but if you can manage your stress effectively, you will be a much happier and productive person :).